Make their childhood magical! This luxury playhouse will delight that special child in your life, as well as their friends, no matter the weather. It is insulated, wired, and even heated, giving them a play-space outside of the house, 12 months a year. This playhouses is loaded and ready to be delivered to your backyard. Make it a Christmas morning they'll never forget. The playhouse is constructed just like any house, with insulated 2x4 walls - insulated because it gets cold in the winter! So there is a Broan wall heater (wired with a safety shut-off switch 52" off the floor) and double-paned windows, which are tempered for safety. There are three arch-topped stained glass windows as well - two up top, and one in the 1 3/4" solid ash arch-top door. The door has figured maple panels and is finished with a marine grade boat varnish for durability. The door doesn't lock, because why would you want a playhouse door to lock? Instead I used a ball latch to keep it firmly pressed against its weatherstripping, but yet still be openable by little ones. I mounted a replica of the sword 'Sting' from Lord of the Rings on the door. It's not sharp, but it is super cool. Ducking your head to step inside, it's actually quite roomy for an adult. There is no loft, though I had originally drawn it with one. One could still be added, but I rather like it without one (no stooping for parents!). The first thing you'll probably notice is the built-in window seat on the opposite wall. It's the perfect place to curl up with one of the many dragon themed picture books that come with the playhouse. The 4" thick cushions are professionally upholstered and the two pillows have a dragon scale print. If you're kids are still too little to quite get up onto the window seat, I've included a solid walnut pull-out step to help them up. On either side of the step are cabinets with soft-close hinges. In front of the window seat, in the floor, is a hidey hole for storing all your childrens' valuables. It's door is flush to the rest of the laminate flooring, so just pull over the dragon-themed throw rug and Alacazam! It's gone! 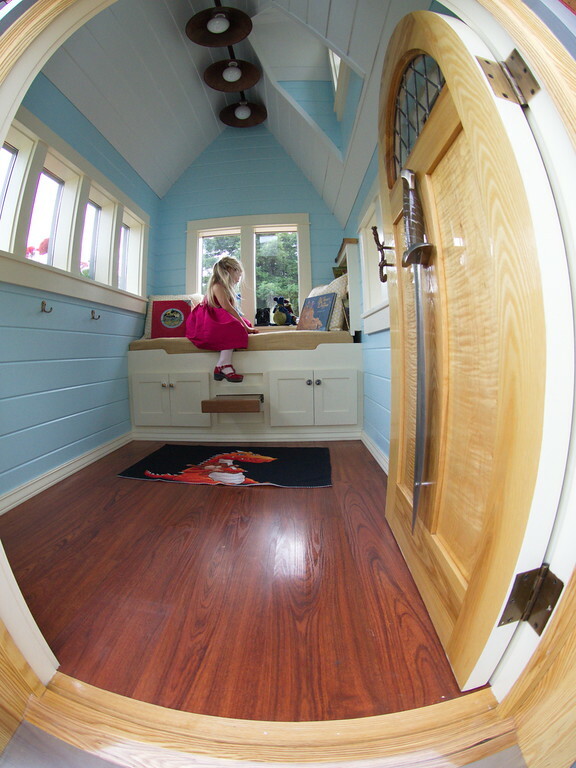 There are two other built-ins: a bookshelf by the window seat and a chalkboard cabinet, also with soft close hinges. Inside are sold walnut shelves for holding chalk. The interior walls are pine, painted with Benjamin Moore paints. Above, the copper light fixture is actually intended to hang above a pool table light. It fits perfectly! The light switch for it is at child height, just like the casement window beside the door. You may wonder why the dragon's head is off in some of the pictures and the reason is so that I can travel down the highway. If I left him on, he'd be chomping through telephone wires all the way to your house. Speaking of electrical: the whole playhouse can be run off an extension cord. Or, if you prefer, I can have an electrician hardwire the playhouse directly to your house. And if the playhouse is within Wi-fi range of your home's network, there is the possibility of enabling the lights and heater to be controlled by your I-Pad. The Dragon is absolutely unique. I put a lot of love into its design and construction and you can see this in the woven cedar corners - each angle different than the last, each spokeshaved to its partner. Where I learned my trade, there was a banner that read "Craftsmanship is integrity you can touch." There are a number of luxury playhouse builders out there. They are good at what they do, but they don't do this. I am a very humble person, but I can say with some confidence that you will not find the combination of quality craftsmanship, an artist's creativity and parent's understanding of children like you will with me. I am open to all reasonable offers. Keep in mind that the materials alone cost $6,500 and it took me 600 hours to build. If you're interested in the Dragon, I'd love to hear from you. * plus tax and installation.